Product code: ES3637 Categories: Sold Items, Sold Jewellery. Quite often there is something so special about antiques and here is a magnificent antique bangle that is just so unique and delightful to not only wear but to admire as well. 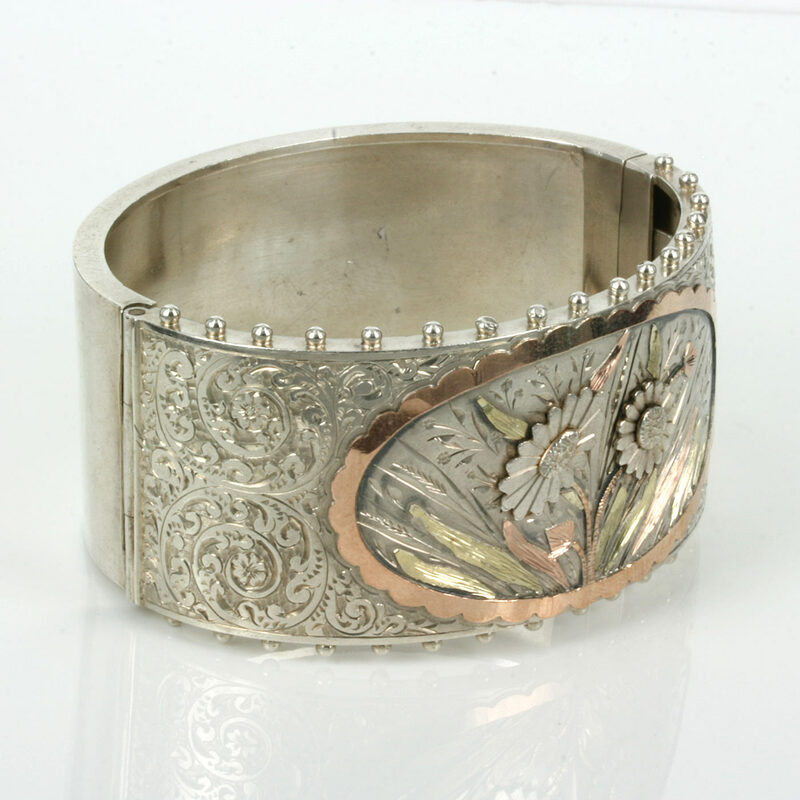 Dating from the late 1800’s, this antique bangle was made in sterling silver with exquisite hand engraving on the sides. Hand engraving is always so far superior to machine engraving in the quality and even the way it feels when you touch it with your fingertips. This engraving would have taken hours of work and shows the quality of the engraver in the finest detail that can be seen. And then there is the floral motif in the centre. In the late 19th Century cadmium was used to make green gold which can be seen here in this bangle. The green gold is a very soft hue of green and was used brilliantly in this antique bangle to highlight the leaves and the grasses and then rose gold used for a wonderful contrast. The use of green and rose gold combined with the intricate engraving all go to make this a wonderful talking point and such a special piece of jewellery that is perfect to wear for any occasion. The bangle measures 37.5mm wide and being hinged allows it to sit nice and close to the wrist making it even more practical to wear all the time. This late Victorian antique bangle is simply spectacular and a wonderful example of antique jewellery at its finest.